In this exciting game you will need to hit all required pegs and watch the ball jump changing direction and performing combos. Try to get all available points on the level. 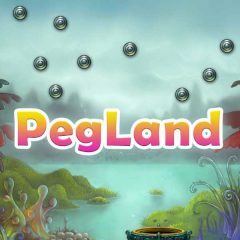 Pegland is the game that will remind you of something! Yes, you are right, the times of your youth! Play it and hit the pegs with variable balls. Use flame ball to burn everything around or a regular steel ball to hit all pegs around. You have limited amount of peg so don't waste any of your shots!